Planting Grass: How To Make It Worth The Trouble! Planting Grass Is More Complicated Than They Tell You! Are you looking for more than just basic information? When you hear or read of a simple “5 step plan” or “7 easy steps” to a new lawn, do you wonder WHY you should do certain things? Why not do something else? What will happen? Reading the “to-do-list” of some garden advisors can lead you to believe that you can jump outside and get the project done before the ice melts in your glass of ice tea. Is your goal to repair or thicken an old lawn, or install a new one? There are similarities and differences with either project. 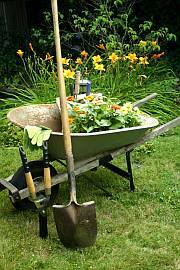 This page is an introduction to a series of articles all related to planting, or replanting, a grass lawn. The approach is to offer the complete story, rather than a simple outline. One specific topic will be addressed in each article. These concise, usable facts will not only help you make wiser decisions and choices, but will give you a head start toward a healthy, beautiful lawn. Isn’t it nice to know the big picture before you jump into a project or commitment? Planting grass sounds almost innocent and peaceful. But there is a lot to consider before you take a pile of tiny seeds and attempt to turn them into a vast green expanse. Even if everything went smooth and easy, there is still a lot to know and a lot to do. Now add the definite possibility that things can and do go wrong when people are putting in a lawn, especially for the first time. It’s good to be informed before you start. Problems happen. Difficulties arise. Location, soil, fertilizer, water, seed, weather, and maintenance all present valid concerns and potential interference with your intention of planting grass successfully. Learn about the overall scope of this project before you get any further along, in this article: Getting New Grass To Grow. That’s what they say. They tell you to set aside time for planting grass in the fall. That’s the best time, by general consensus. But what if your schedule gets a little complicated, and fall doesn’t work for you? Is there another time when it will work just as well? Learn why the fall season is usually the best time to start grass growing, and why sometimes it is not. Discover that the best time for you can be the best time for the grass also. Read more: When Is The Best Time To Plant Grass Seed? What exactly do you have to do with the seed to get it in place and ready to grow? Most resources give very limited guidelines. They assume you know a lot already. You deserve better. Learn all the details about planting seed, and the reasons why you should take one approach or another. Get a list of everything you need to have on hand before you start. Evaluate all the conditions before your project gets the green light to go. This guide tells you when and how to put the seed down, and what comes after that. Know what to avoid in this important aspect of creating a lawn successfully. Every step for sowing the grass seed is found in Planting Grass Seed. What happens between the time you plant the seed until you see it finally bursting through the soil? The germination process may be long forgotten from your days of science classes. However, knowing the key factors that affect germination might keep you from making a mistake. Improve your success ratio even before you plant, with these interesting suggestions, including evaluating the actual seed you plan to use. Discover the facts about Grass Seed Germination, and things that can interfere. You can make a minor or major investment in your project as you consider design, preparation, and finally planting the grass. But then the success of all your effort hinges on the simple chore of watering. You can over-water. You can under-water. You don’t want to do either. You don’t want the seed to die. You don’t want to be buying seed and planting it a second time. Take advantage of these tips for watering grass seed in several different situations. Avoid troublesome problems as you deal with those important days and weeks till the grass pops up. See tips for Watering New Grass Seed. Not Sure If You're Up To It? Some of you may in a position where you prefer, or need, to bring in professional help. At this point you have the option of just getting someone to install the lawn, from seed or sod, and then take care of it yourself. You might want also want to continue on with lawn care service done for you. The following two Guides may help you decide if this is a good idea. Knowing what to consider is essential, whether you talk to franchise lawncare companies or a private individual lawn maintenance person. Guide #1: Lawn Care Services - What Do You Need? Before You Hire A Lawn Service, Ask Yourself A Few Questions. #2: Lawn Care Companies - What Will You Get? These free comprehensive articles are detailed and extensive, with information you won't find in any book, but they may be just what the doctor (or the Counselor) ordered to make your life easier! Varieties of grass seed and their characteristics. How to select the right grass or blend of grasses. Spreading grass seed by hand or with spreaders. Tips for repairing bare spots in the lawn with loose grass seed or patch kits and mats. How to plant new grass seed over an existing lawn, step-by-step. Choosing between grass seed or sod for a new lawn.